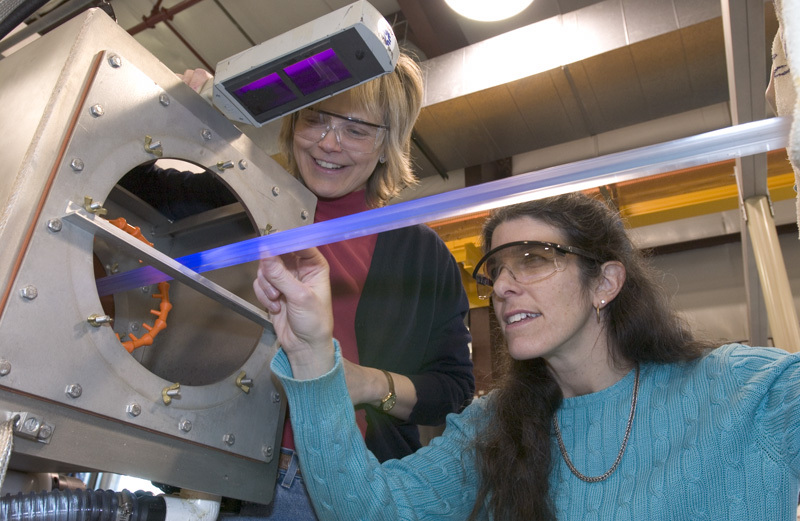 Anna Pla-Dalmau (left), leader of PPD's Scintillation Detector Development, examines scinitillator for the MINERvA detector with project manager Debbie Harris. When experimenters are decked out in Sunday best, it usually means they're being reviewed. MINERvA collaborators are decked out this week for a Director's Review, after receiving CD-0 approval ("the science is needed") from the Department of Energy for the low-energy neutrino scattering experiment. Documentation for the CD-1 approval ("selection of a conceptual design") is now being reviewed by DOE. The rigorous Director's Review will prepare MINERvA to advance to CD-2 and CD-3A, involving comprehensive understanding of the costs involved, and issues for long-term procurement. "We're very encouraged by the way things are moving along," says MINERvA co-spokesperson Jorge Morfin of Fermilab, hoping to complete construction in 2009. "We've been working on the preparations for a long time. The CD process is like a row of dominoes: you need the first one to fall before the next one can, and so on down the line." Another reason for encouragement: MINERvA has received a Major Research Instrumentation grant of more than $777,000 from the National Science Foundation. MINERvA co-spokesperson Kevin McFarland of the University of Rochester is the principal investigator on the grant, awarded to a consortium also including the Univeristy of Minnesota-Duluth, Hampton University, University of Pittsburgh and the College of William and Mary. "We're excited to have strong support from NSF for MINERvA," says McFarland, "and the MRI grant will allow us to upgrade the capabilities of the experiment." MINERvA had prepared the CD-1 documentation before CD-0 was granted, and CD-1 approval could come quickly. That would match the quick pace of work on the experiment. "The R&D on the detector components is marching along," says project manager Debbie Harris of Fermilab. "The detector does tracking just like our computer simulations, and that's really exciting." seven-week illness. Orr was an engineer in the PPD Electrical Engineering Department. Orr came to Fermilab thirty-six years ago after graduating from Elmhurst College with a bachelor's degree in physics. While working here as a technician he earned another bachelor's degree, this time in electrical engineering, and was promoted to engineer. He became licensed as a professional engineer in the states of Illinois and Minnesota. Over the years, Orr served as chair of the Power Commission Committee that was charged with reviewing all large electrical power consumption issues. He also served as chair of the lab's Cogeneration and SCADA efforts and he served as chair of the Electrical Safety Subcommittee. Orr spent most of his career working on power distribution, power supplies, and electrical safety issues. Most recently he served as project electrical engineer on the Cold Dark Matter Search and the MINERvA experiments. Outside of the lab, Orr volunteered his time as a chaplain at the Dupage County Jail where he often worked with young inmates. "He strove to help them find ways to make better decisions in their lives going forward," said Bob DeMaat, deputy head of PPD's Electrical Engineering Department. "Stan was a fine man and he will be sorely missed." A visitation will be held today from 4:00 p.m. to 9:00 p.m. at the Hultgren Funeral Home, located on Main St. in Wheaton. The funeral will be on Thursday at 10:00 a.m. at the Lombard Gospel Chapel, located on 369 N. Stewart Ave. in Lombard. In lieu of flowers, the family has suggested that memorial gifts be directed in memory of Orr to The Gideons International, Post Office Box 140800, Nashville, TN 37214-0800. This week's column features David Carlson, Head of Fermilab's Business Services Section. As a Fermilab employee, user or vendor, you have almost certainly been helped by the Business Services providing goods and services for Laboratory's programs; housing for users and their families; books and publications; telephones and radios; photography and visual media services; travel arrangements; food or fun in the cafeteria or Users Center; stockroom supplies or inventory tracking; daily mail; import or export arrangements; vital security and fire emergency services; a fleet of government vehicles; on-site transportation, or a reliable record of Fermilab's history. This breadth and depth of service stretches out over the lifetime of projects and programs, from early acquisition planning to final disposition of retired assets. We can handle unusual requests such as coordinating the final off-site transfer of hundreds of retired main ring magnets to a distant state. We accomplish these tasks safely and with close attention to environmental protection. Business Services personnel have gone well beyond their goals--first a year, then a thousand days--without anyone losing a day of work, being restricted, or having duties transferred due to an injury. They've been recognized for their use of alternative fuels and recycling in contributing to national environmental protection. They perform all this work within the bounds of a complex host of laws, rules and regulations, while striving to minimize the effects on the day-to-day operations of the Laboratory. My greatest pleasure on the job is to be able to work along with these fine and dedicated people in trying to find better ways to support Fermilab's exciting science mission. 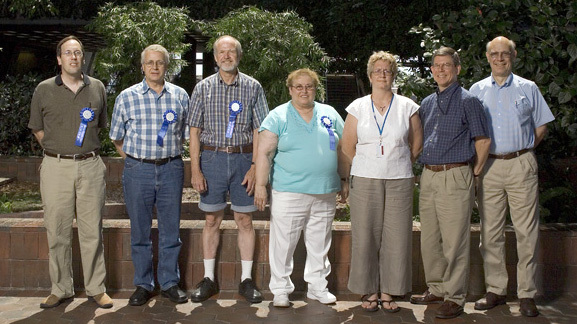 10 Year Service Award Group Photo: Douglas Tucker, Alexandr Drozhdin, William Secora, Audrey Arns, Margaret Greaney, William Shull, Bruce Chrisman (Directorate). 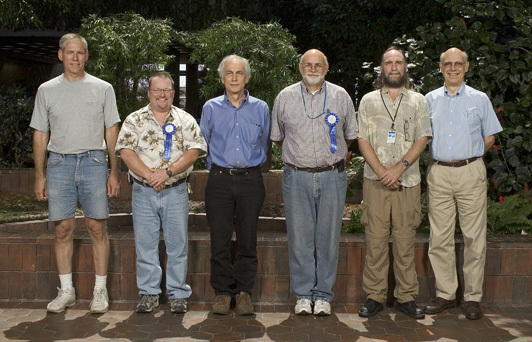 20 Year Service Award Group Photo: David Butler, Lonnie Lasourd, Paul Mackenzie, Rick Van Conant, Peter Kasper, Bruce Chrisman (Directorate). WASHINGTON, DC - The U.S. Department of Energy (DOE) has awarded a new $2.5 billion, five-year contract for management and operation of Argonne National Laboratory (ANL) to the UChicago Argonne, LLC, owned solely by the University of Chicago. The new independent entity was supported in its proposal by the University of Illinois at Urbana/Champaign, the University of Illinois at Chicago, and Northwestern University, participating with the LLC in making significant financial commitments to support scientific activities at the laboratory. At 11:00 a.m. today in One West, ILC communicator Elizabeth Clements will outline the Strategic Communication Plan for the ILC and describe the year ahead for both global and local ILC communications activities.